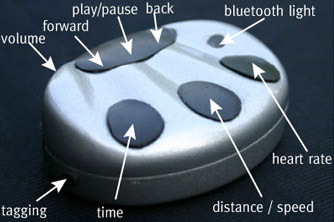 The three buttons on which the fingers rest access the timing, distance/speed, and heart rate functions. To start or stop these functions, tap the function and the start/stop button, which is easy to do because the fingers and thumb automatically fall into place. To clear the data in any of these functions, tap the function button and then hold down both start/stop buttons for 3 seconds. The three raised buttons control the music player. You can start and pause the music by tapping the middle button, or stop the music altogether by holding down the play/pause button for 3 seconds. The buttons to the right and left of play/pause skip the music track forward and backward one song. The navigation wheel is used for accessing audio menus for Actively Mobile services, as well as for modifying presets during a run. When navigating the audio menu, start/stop acts as a select key. The tagging button is used for recording locations during a run, in order to automatically track performance data between two set points within a route. To tag a new location, hold down the tagging button until you hear the feedback "Point 1 tagged." To tag the second location, hold down the tagging button again, until you hear "Point 2 tagged." To clear the tags, hold down both tagging buttons for 3 seconds. The audio volume of the audio can be adjusted along the side of the device.